Among hundreds of programming languages, PHP continues to be one of the most popular in the world of web development. Within the PHP language exist multiple frameworks that are unique and different despite being built for the same language. The scope of your project can help determine which type of framework you need to use and what skills your developer should have. For example, enterprise level applications require you to hire Symfony developer while highly scalable web applications will be better suited with a CakePHP developer. In the ever-changing world of technology, PHP has held its ground. For a long time, PHP programming hiring remaining the in-demand request for the biggest part of the projects. Where many languages become obsolete as new code and programming are developed, it is interesting to see PHP stands strong. Perhaps it is the multiple frameworks within the language that keep it alive as they serve as a reincarnation of the language. Let us take a closer look at PHP and one of its most popular frameworks: CakePHP. Before we get into any specifics, let us first explain what is CakePHP after all. It is a free framework for PHP programming that has an open code. It was released back in 2006 by the Cake Software Foundation and was inspired by Ruby on Rails. At the very beginning, the release of this framework was mainly for promotional purposes for other products. But as time passed by, CakePHP development found its own niche. If you look at this data, you will see that there are almost 200.000 websites that are currently using this framework and over the years, this number had only grown. What makes CakePHP development so appealing? Let’s find out. Orangescrum – a flexible project management web app that helps organize project activities. Zhen CRM – a self-hosted, full source code CRM. Vamcart – an open source shopping cart that is easy to use and install. QuickApps – an open source CMS that allows for the development of complex websites. Croogo – a multilingual CMS. One of the major advantages of working with the open-source framework is the rapid application development with CakePHP. CakePHP has an active developer community that makes the code easy-to-use. With CakePHP application development, developers have the foundational structure they need to begin your project quickly and focus on the details specific to your application. Tiobe, a website devoted to the software industry, continues to collect and publish statistics about programming languages used in web development today. According to a recent study, PHP is still alive and well. In fact, it has jumped two spots on the chart since last year at this time, ranking number 7 in the most used programming languages today. So, how does PHP maintain its relevance? One of the main reasons PHP continues to be a popular language is because of its modern edge. Through easy-to-use, powerful frameworks that lead developers to choose PHP for a variety of projects. The release of many PHP frameworks, such as Symfony, CakePHP, Yii, and Zend, have served as somewhat of a reincarnation of the language. Giving PHP the competitive edge it needs, the frameworks have continued to serve developers on their most popular projects. Although PHP frameworks are essentially the same language, they have unique characteristics that make them perfect for some projects and not right for others. Some are more complicated and difficult to code, while others are easy for beginner developers. Some are intended for larger projects, while others are better suited for smaller, less complex projects. Regardless of which framework you use within PHP, you should be sure you examine the features and functionality associated with the framework to make sure it properly fits your project requirements. Documentation. Whenever you start working with a new framework you might want to read through all its documentation first, to get more familiar with it. When things get down to CakePHP – your first impression will be great, as all the documents regarding this framework are easy to read and well structured. Speed. The faster your framework works the better. 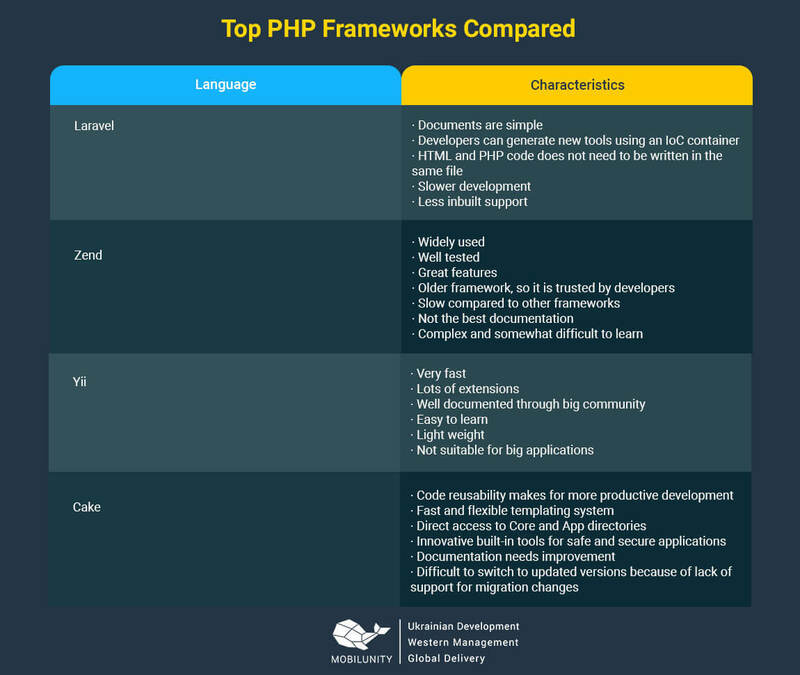 There are even some programmers, who CakePHP find the best among all other frameworks in terms of speed. Structure. If you are CakePHP coder, you know, how this framework ‘loves’ structure. That can be both good and bad, depending on the side, you are looking at it from. However, while working with CakePHP make sure, that you follow its rules and name your models and methods a certain way. Safety. This aspect is crucial for any CakePHP developer, however, it might not be that easy to ensure that, with Cake. The whole access control system here is a bit difficult for understanding, so you might want to get deeper into that, before you use if for anything serious. Documentation. Yes, we have already discussed it, but there are some things worth mentioning about its flaws as well. The thing is that there is nothing in the manual, that would help you if you will ever need to deal with some fails of the framework. Whenever something is not working – you are on your own with it. Lack of simplicity. While CakePHP may be a good framework, it still requires some knowledge from the programmer, so it might not be the best choice for those who are only beginners in this field. However, if you pay some time and try to figure it out, you might even prefer it to other frameworks. Your CakePHP provider should also be skilled in project management to ensure your project is completed quickly and to your satisfaction. Hands on object oriented PHP programming is also needed to successfully execute the project development. Analyze the details of your project and see what skill set and tools your developer has experience with relating to your project specifics. For example, CakePHP mobile app and CakePHP eCommerce project development will differ. If you find a developer who has years of experience building CakePHP mobile apps, but you are looking for a eCommerce project, you should continue your search. There also many ways to hire CakePHP developer. If you want to hire CakePHP developers, you have to learn about their rates first. CakePHP salary varies depending on the type of job you are hiring for and where you hire PHP programmer from. According to Glassdoor, CakePHP developer salary in USA is around $74,800 annually. Additionally, many CakePHP developers take on freelance projects that range from $100-$200 an hour depending on experience. Fortunately, for the sake of saving money without costing yourself quality development, there are other options available at lower rates. While some businesses want to hire CakePHP developers locally, there is a wide variety of talent available thanks to the internet. Ukraine, for example, is one of the leading sources of quality PHP developers at a fraction of the cost of US developers. Entry-level CakePHP programmer in Ukraine earns $19,100 of annual salary on average. Even experienced CakePHP developers in Ukraine come in substantially lower than developers in the US with an average annual salary of $30,500. So basically, CakePHP developer salary may depend mainly on two things – the experience of the developer and country that he or she comes from. This way you might want to turn your research party to countries like Ukraine or Russia. Why? We will discuss that a bit later. When you will be looking for your perfect CakePHP team, you will come across all kinds of options. While checking every CakePHP developer resume sample you can find online, pay attention to those, who come from Ukraine. There is a reason to that. This is a well-known fact, that Ukrainian programmers are among the best in the world, according to the recent research conducted by the Hacker Rank. Ukraine is among those countries where the total number of IT students is quite high, so it is only understandable that most of them later start building their careers in the programming field. Another great thing about Ukraine is that you can outsource your tasks to a CakePHP PHP development company, there are many of them there. The great thing about using an outsourcing CakePHP company is that this allows you to significantly reduce your expenses. There are, however, some things you have to keep in mind, before choosing your specialist. Now that you have decided a CakePHP programmer is the best option for your development project, you need to hire CakePHP programmer of the right match. Hiring locally is an option but can be quite expensive. Even freelance developers can come at a hefty price when hourly rates add up to an expensive outcome for your project. That is why many people choose to hire remote developers. Expert professionals whose talents and experience surpass local developers. Flexibility and adaptability from developers who understand projects and are used to change. Top notch development with quality services and great communication. Quicker turnaround times and better project management. Lower costs without sacrificing work quality. So now that you know which country to choose as your source for CakePHP programmers, let’s talk about some particular companies that provide outsourcing services in the programming field. One of many Ukrainian CakePHP development outsourcing companies is Mobilunity. Why you should choose it? Because it is the best and right now we will explain to you why. As if hiring remote CakePHP developers did not have enough benefits, Mobilunity brings their customer dedication one step further with CakePHP web services. While some CakePHP development projects require a single service for development, other projects require ongoing maintenance and upgrades. As you saw earlier with the annual salary of PHP developers in the US, this can lead to a major expense for your business. Ongoing CakePHP services allow clients to get the CakePHP development they need at a price that is affordable. Our dedicated coders work ongoing projects with many clients who benefit from lower costs and shorter delivery times through our monthly services. So, you can still deploy amazing CakePHP applications and ensure they are properly run and maintained without worrying about outrageous costs for development services. It really is the best of both worlds as you watch your CakePHP projects come to life in the hands of a development team you can trust. For dedicated remote PHP developers for your next CakePHP development project, trust Mobilunity for quality programming at the best rates! Programming world has pretty tough competition and web developers know that. If you want to stay on top, you have to use the best technologies and CakePHP is surely on that list. Nowadays almost 200.000 websites use this framework and the numbers seem to be only growing. The reason for that is the simplicity of use of CakePHP and its diversity, which allows developers to use it for various projects. Just as an open source framework, CakePHP has its strengths and weaknesses. However, the strengths seem to be leading on this case, so more and more programmers are starting to pay attention to it. Speaking of programmers, if you want to hire a specialist that knows how to deal with CakePHP, you might want to check out everything that we discussed before, as there are some crucial skills that your perfect candidate must have, make sure that they are present in his or hers resume. Finally, when you are looking for a good CakePHP developer, pay attention to Ukrainian specialists, they often charge less for their services than those, from other countries. But the chances are high that you will receive better results in the end. There are lots of outsourcing companies in Ukraine, like Mobilunity, that provide services in the programming field, reach out to them. Hire CakePHP developer for your project with us. Trust Mobilunity for quality programming at the best rates!